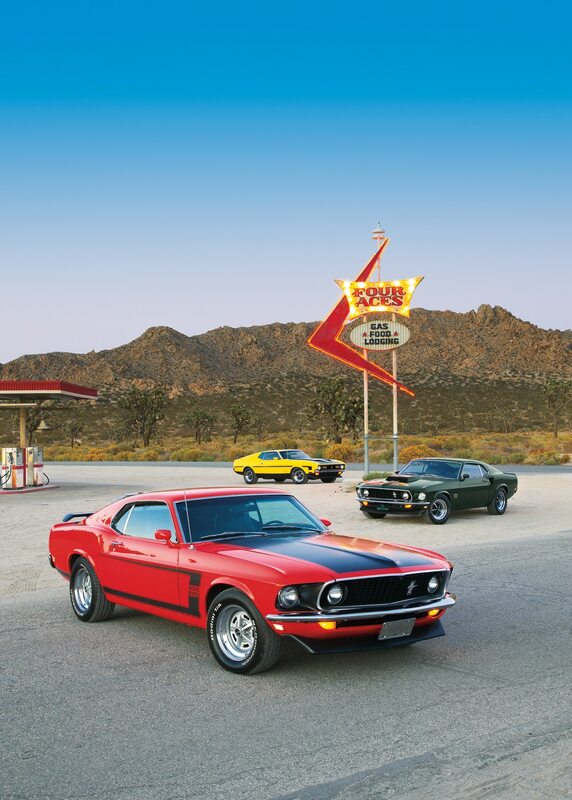 The Mustang Boss 351 marked the end of an era. It was one of the last, true muscle cars Ford produced, and they made it count, pulling out all the stops to create a vehicle known for both speed and performance. Produced for only one year, the 351 is often an afterthought or forgotten altogether, which is a shame 'cause looking back, this car really shines. Ford spent the late 60s honing the muscle car. Two versions of the Boss Mustang were introduced for the 1969 production year, and they tore up the track and won over consumers from the moment they hit the pavement. The 302 duked it out with Chevrolet’s venerable Z/28 Camaro in the Trans Am racing series. On the NASCAR circuit, the 429 finally gave Chrysler a match for its seemingly unstoppable 426 Hemi. If muscle cars were hot with consumers, then the Boss Mustangs were on fire. By 1970, the landscape changed. Insurance companies hiked up their premiums. The government was in the throws of passing new safety and emissions regulations, which took effect for the 1972 production year. The writing was on the wall for the burst of the muscle car bubble, and Mustang sales plummeted. Ford began to distance itself from factory-supported racing, and it killed both the 302 and the 429 before the 1971 production year. The high-output 351 cu. in. R-code V8 truly was the best of both worlds. This small-block engine packed 330 hp at 5,400 rpm and 370 lbs. ft. of torque at 4,000 rpm. This not-so-silent but deadly killer would outgun many of the big blocks. In fact, Sports Car Graphic magazine found that a 1971 Mach 1 packing a 429 Cobra Jet engine eked out a win over the Boss 351 in a race from zero to 60 mph with an e.t. 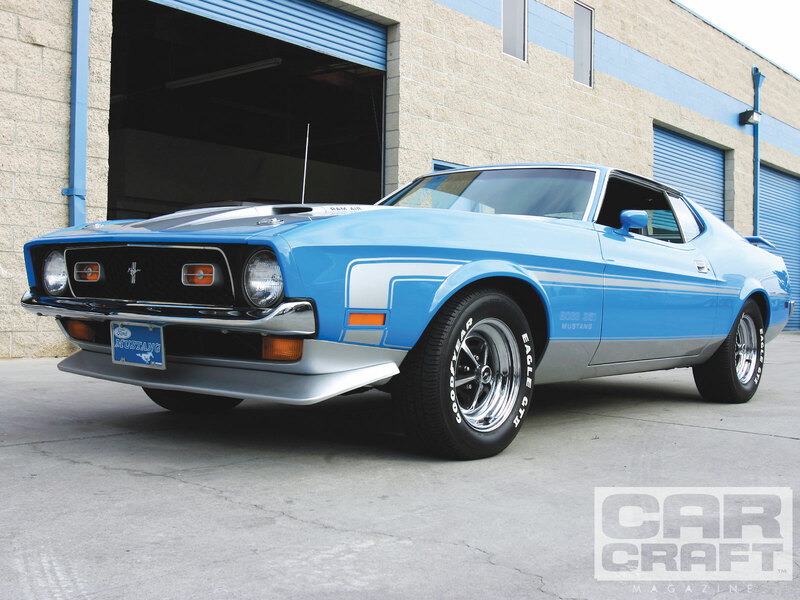 of 6.3 seconds compared to the Boss’s 6.6.—and the Mach 1 had a 78-cubic-inch advantage. When you consider that many critics found the small-block vehicle to have better balance, the Boss becomes tough to beat. Performance extended beyond just the engine. The 351 was paired with a Hurst-shifted four-speed manual transmission, which had a Traction-Lok 9-inch rear end and 3.91:1 gears. All that sat on a beefy Competition Suspension package and power front disc brakes. Outwardly, the Boss 351 resembled the Mach 1. The Boss is marked with twin functional "NASA" hood ducts, the Mach 1 honeycomb grille, and lower body paint treatment and bodyside stripes. The difference lay in the Boss Mustang decals on the front fenders and the tail, and it also had a larger blacked-out area on the hood. When it hit the showroom floor in the fall of 1970, the Boss 351 carried a hefty sticker price of $4,124, which was $1,000 more than the base Mustang SportsRoof. Today, they can go for anywhere from $12,000 to $75,000. And if you’re in the market (wouldn’t that be nice) the most surefire way to determine whether you’re dealing with a bona-fide 351 is to look at the VIN. The fifth character will be an "R," which designates the high-output Boss 351 engine. And then you can drive like a boss in your Boss.